OK. So this will be my last post of any Marathon watches. The GSAR is basically the same watch as the TSAR except that it is automatic. The size and the appearance are otherwise identical. It also has the tritium tubes which doesn’t need any charging and makes it extremely easy to read even in the darkest conditions. The darker the better as a matter of fact. The tubes are supposed to have a life time of 25 years but when they are dead they are dead for good. It is easy to separate a new dial from an old one. I’ve had watches with tubes that have been only five years old but you could clearly see the difference when comparing it with a new dial. I bought my first GSAR in January 2011. It came on the original vanilla-smelling rubber. Great watch! I don’t remember if there was a specific reason why I sold it. I probably just got bored after a while and needed something new. 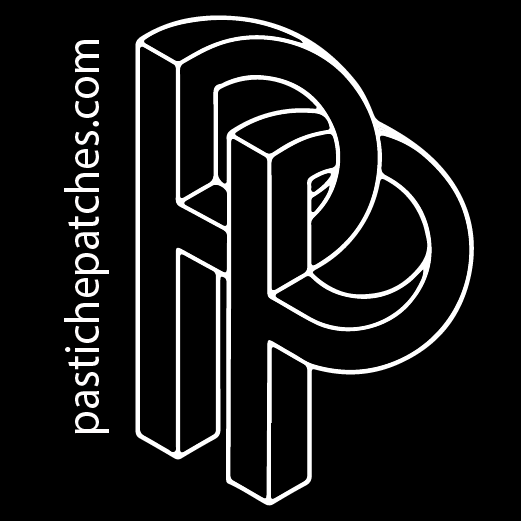 #63 – The Maraton GSAR with its little box. A wrist shot with a nice thumb print all over the crystal. Bought my second one in the summer the same year and got it on the steel bracelet that time. That bracelet is just fantastic. So solid, comfortable but most of all good looking. It think I sold it to save up funds for an IWC Aquatimer. #91 – Far out in the Stockholm archipelago fishing for pike. GSAR on the wrist. Even though the GSAR is fantastic I still think it gets beaten by the SAR, JSAR and the TSAR. The only model in the SAR-family I haven’t tried yet is the CSAR but since I’m not a big fan of chronographs and since it shares its size with the mighty JSAR I don’t think I will either. I've just grown tired of big watches. This was my first Breitling. A blue dialed titanium Seawolf. Prior to this I had only been associating Breitling with flying and watches made for pilots but when I one day read 3000m on the dial of the Seawolf I was like “What the f**k! Is this for real? 3000m! That’ insane! This is not a pilot’s watch, it’s a diver!” Even though the appearance clearly states that the Seawolf isn’t made for flying I had never taken Breitling in consideration when looking for new dive watches to try out. But the Seawolf was the watch that made me re-consider things and I just had to have one! #61 – The Breitling Avenger Seawolf ref. E17370. 1st of Advent 2010. Cuddling on the couch with some mulled wine. I know, not the kind of action a watch like this deserves but this was the only picture I had when wearing it. With its width of 44mm and a height of more than 18mm it sure is big but thanks to the titanium it becomes wearable. But just as the Marathon JSAR I had it gave me the same problems. This was in November 2010 and I was still working extra in a warehouse picking stuff from shelves and when working at the crazy pace I did it kept banging into everything. My boss at that time was wearing a Breitling Headwind (really nice!) and I remember I walked up to him the first day when wearing the Seawolf and said “Hey! Nice watch but check out this bad boy!” and waived it in his face. The Seawolf really made a good impression on me. It gave off a sense of being a very high quality watch and I was truly amazed by the details on the dial. Everything was so perfect and sharp. The experience with the Seawolf made me view the Breitling brand in a whole new perspective and it was all for the better. The titanium version was discontinued in 2008 and was replaced by the current steel version. I must say I preferred the Ti instead of steel. The steel just make it ridiculously heavy. Also I think the dial design was much better looking on the old Ti’s. I found this beauty for sale in October 2010. It had recently gone through a service so the interior was in top condition while the exterior showed some signs of being worn for some time. I received it without any box or papers and I never took a picture of the case back so I don’t know how old it actually was. I’m not sure if it had a tritium dial but the surface of the markings didn’t look as smooth as luminova usually do and also they were fading towards yellow. I can’t believe I lost money on this watch. I bought it cheap but apparently sold it even cheaper. I can’t remember for what reason but for being a newly serviced watch with the old T-marking dial (and perhaps also with a tritium dial) it must have been one of those recurring stupid deals that have taken place every now and then during the journey. 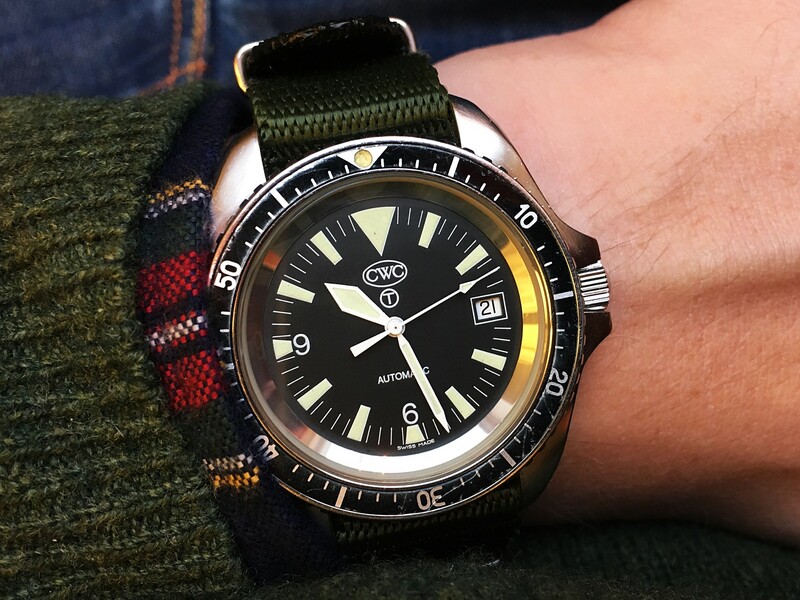 #54 – The Royal Navy automatic diver from Cabot Watch Company. I’ve only had one automatic CWC diver. When it comes to the different quartz models I think I have had at least six of them. I love the design of the watch but I can’t see it as an everyday wearer and therefore think it’s more comfortable to have a quartz lying around. I really want to encourage people to buy the CWC’s instead of all crappy knock offs out there on eBay. We’re not talking about any huge savings to make on the cheapies. Just chip in a couple of extra dollars and you’ll get a used CWC instead. You won't regret it! UPDATE - January 11th 2017. Wow! I can't believe this one came back to me. To my great luck the owner I sold it to back in 2010/2011 had kept it all this time and when I threw a vintage Breitling his way that I suspected he might be interested in he accepted to give it back to me in a trade. I've really missed this watch. It's not until now that I've truly started to understand and appreciate it. At the moment I have no plans at all to get rid of this watch. I also got to learn that it was issued in 2002 which was something I didn't bother to look up the first time I had it. The automatic diver back in the collection! Here seen together with its two quartz brothers. I just love the vintage look it has developed throughout the years. Out for a walk on Christmas Eve. I loved this watch! What a great beater. Pretty much the same look as its automatic brother except that it’s a little thinner and not as wide. 40mm excl. crown if I remember it right. It wore great and I mostly had it on a black nato strap. I was just lucky when I found mine. Put out a want-to-buy add and immediately got a bite. I had mine during October 2010. Bought and sold it for about $200. Nowadays they’re rarely seen for sale. If you see one, buy it. #53 - The Glycine Combat SUB quartz. Ref. 3864. Resting on my modified Fender Stratocaster Eddie Van Halen tribute. I found this little bad boy on eBay back in September 2010. Threw in an offer while being a little drunk one evening, forgot about it, and then received an e-mail a couple of days later saying I won the auction. Classic! It came on a bracelet I haven't seen on any other Khaki's and it looks a little IWC inspired. The movement inside was an ETA 2824-2 and the case measured 36mm. A great casual everyday wearer. #51 - The Hamilton Khaki automatic. See through case back with the ETA 2824-2 visible. Funny story when I sold this watch the first time. I met up with this guy Björn that I hadn't done any deals with before. Björn greets me on a shady subway platform with a huge dog (and I'm terrified of big dogs) and has tattoos all over his arms. I was sure he was going to rob me. Of course he turned out to be the sweetest dude and we have been good watch buddies since. A couple of years later I started to miss it and asked Björn if he still had it. He'd given it to his dad and told me I could have it back as long as I could find a watch that his dad liked more than the Hamilton. I gave Björn loads of suggestions but nothing worked until one day when a Kemmner showed up for sale. I paid for the Kemmner and asked the seller to ship it over to Björn's dad and then got the Hamilton sent to me. Mission complete! I wore it every now and then but mostly it got to spend time in the drawer. 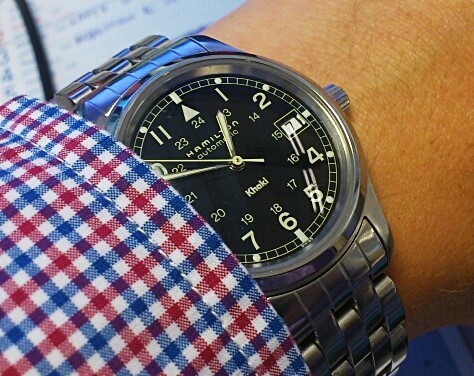 A wrist shot at work. It sat in the drawer for quite some time but finally got some attention from another friend who asked if could have it. Christoffer has been wearing it together with his Seiko SKX007 since 2012 and I love to see it on his wrist. I haven't had any Hamilton's in a while but after seeing the movie Interstellar with Matthew McConaughey last weekend a little spark lit up to a flame inside me. The old military style Khakis are really cool watches. One of the true icons out there. The Doxa SUB. This is a fact you quickly learn while browsing through all the watch forums. I kept my eyes open for one constantly but as soon as I found one they were all located in the US and also quite expensive. The 750T Professional was the first Doxa that popped up on my radar that was available for me to buy within Sweden. Up until then I had only been buying watches for less than 10.000 SEK (approx. 1160USD with today’s exchange rate). It took some time before the seller and I could agree on a price. I wasn't ready to break and exceed the 10.000 SEK limit just yet and finally that was the price where we settled. It was a full set complete with the tube and the tool for the sizing of the bracelet. #49 - The Doxa SUB 750T Professional. Full set. I absolutely love the look of the Doxa SUB and I prefer the Professional model with its orange dial. Everything about the appearance just feels right. It can't be mistaken for nothing else than a diver's watch. Even though I’m not totally sure of how to use the bezel and its markings I love the look of it. All the SUB re-issues got their own measurements. The 750T is one of the larger ones and measure 44mm excl. the crown. I quickly realized the proportions weren’t perfect for me. It felt too big. I didn't like the thin font that was used on the dial either. It should have been thicker according to me. It got to accompany me for a month or two before I decided to let it go and try another model. Some city fishing back in September 2010. Caught nothing that day. Waiting for burgers together with Oscar at Uplands Nation in Uppsala back in August 2010. You get a glimpse of the Victorinox Divemaster that I sold him earlier the same year. Lately Doxa has produced some really weird stuff. Especially their Asian line feels really cheap. They are so ugly and don't deserve to be called Doxa. It really makes me sad to see they've sold out their brand. Their re-issues of the classic 300T, like the 600T, 750T, 1000T & 1200T, were all really great but the models like the 800Ti, 4000T & 5000T doesn't speak to me at all. I don't like the new design of the bracelet and things like power reserve or tritium tubes (even though I love tritium tubes) doesn't feel like features that are very Doxa-like. 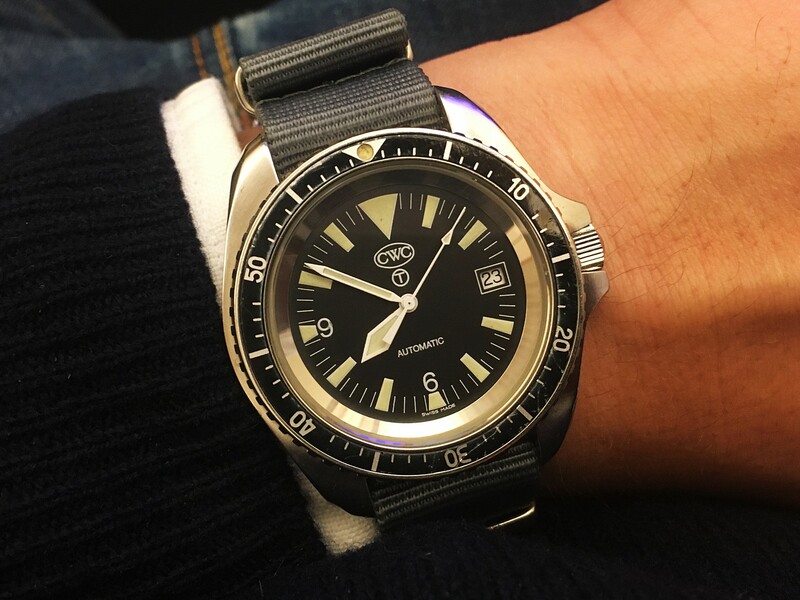 I have never owned a vintage SUB and since I'm not a big fan of vintage watches at all I probably never will but a SUB 600T Professional (without Dirk Pitt printed on the dial please!) is something I really would like to own. I actually had a 600T being delivered to my hotel, The Drake, while staying in Chicago for a week together with my wife for our fifth anniversary in April 2012. I kept asking the reception every day if there had been a delivery made for me but nothing showed up. On the last day of our stay the seller contacts me and says he received the package in return. Apparently there had been a huge delay at the Fedex hub in Memphis due to bad weather conditions and for some reason the package went back to him instead of continuing its route to Chicago. I was so disappointed that I bought the first Doxa that showed up when I came home to Sweden which turned out to be a 1200T Professional. More about that one later.